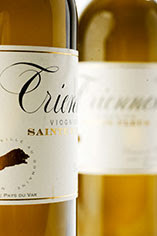 In a lot of ways, Domaine de Triennes is like the 1992 United States Olympic basketball squad—the legendary Dream Team. This Southern French estate, like its sports-world predecessor, is all about the best people finding themselves in the right place at the perfect time. And the results, like they were for those hoopsters, are spectacular. The two most famous names behind Domaine de Triennes are Jacques Seysses, founder of Burgundy’s highly regarded Domaine Dujac, and Aubert de Villaine, co-owner of what is possibly the most revered producer in the world, Domaine de la Romanée-Conti. (The third partner is Michel Macoux.) The result of their vision, labor, attention to detail, and deep respect for the land and the wine produced from it—at least as far as their phenomenal 2007 Viognier is concerned—is everything you would expect from such a group. The 46-hectare vineyard, planted to Viognier, Chardonnay, Cabernet, Syrah, and Merlot, is nestled in the Pays du Var, east of Aix-en-Provence. It’s altitude (approximately 1,375ft – 1,475ft) and southern face combine to afford the grapes the opportunity to achieve ideal ripeness while still maintaining fresh acidity. This sense of balance was, in fact, the first aspect of the Viognier to strike me upon taking that initial sniff and sip. Aromas of orange blossom, honeysuckle, and minerals rose from the glass, but without the overly lush perfume and lack of freshness that so many Viogniers suffer from. The real surprise, though, was on the palate, where the wine’s super-fresh acidity provided a sense of posture and structure that is all to rare with this grape. Notes of orange oil, mineral, and sweet summer stone fruit dominated the mid-palate, and were given an added sense of drama by the plush texture. The finish brought a subtle orange-pith bitterness that kept the richness of the mid-palate from growing overwhelming. This structured, brilliantly crafted, and utterly delicious wine is one of the best Viogniers I’ve tasted all year. And the price—under $16!—is nothing short of miraculous. Thanks so much for posting my Drinks Matcher widget in your right-hand column Brian! Any pairings to suggest for it?